Bad Joke of The Day: IHOP Tweets Horrible Breast Joke, Immediately Regrets It - The Daily What - Daily Dose of WHAT? Let's stick to making mediocre breakfast, IHOP. Social media isn't for you. The pancake house is in deep syrup after making a joke on Twitter Sunday that fell...flat. The reaction to the joke was swift, which likened a stack of pancakes to a women with a flat chest. But this isn't the first time IHOP has tried variations of misogyny. It looks like the company tweeted about a "butter face" back in March. It didn't take long for IHOP to tweet out an apology. It almost seems like they knew the backlash was coming. 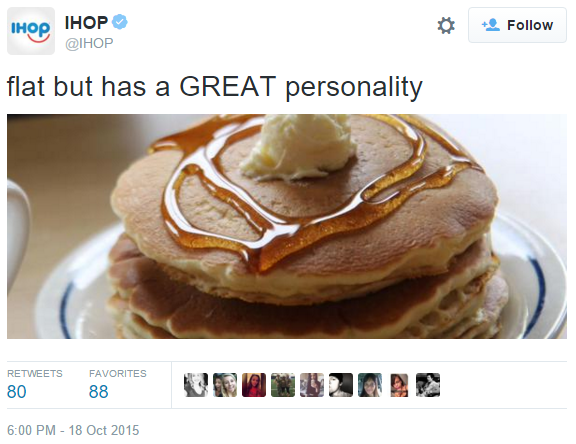 Earlier today we tweeted something dumb and immature that does not reflect what IHOP stands for. We're sorry.